A woman and her daughter is suing American Airlines and flight catering company Sky Chefs for one million dollars, claiming that their airplane food killed her husband. I would sue Sky Chefs for crimes against humanity and good taste. They lawsuit claims the food was infected by Clostridium perfringens, a common food poisoning bacteria that, according to the FDA, has caused a few deaths. The infection killed husband Othon Cortes after experiencing "discomfort and pain that included sharp stomach cramps and sudden thirst and other clear outward manifestation of severe physical illness." He arrived dead to his destination after suffering a cardiac arrest. Sky Chefs, which handles the food for 300 airlines, denies the allegation. They say that they didn't even handle the food for that flight. 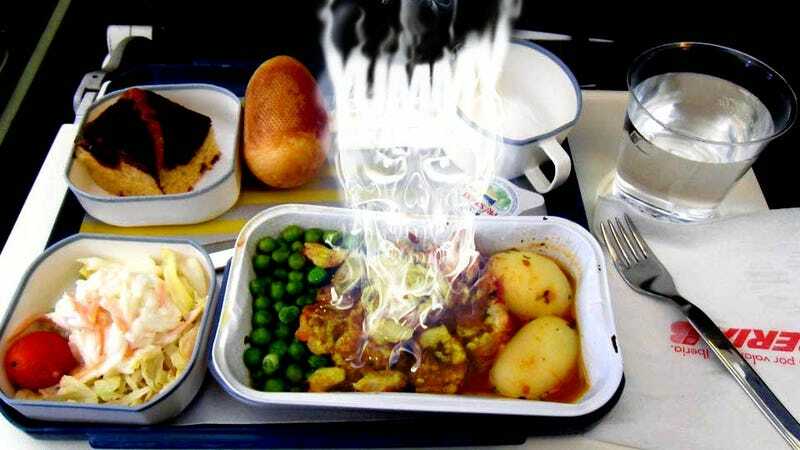 Well, I don't know if the claim is true or not, but Sky Chefs should be brought to the International Criminal Court and processed for crimes against humanity, including massive cruelty inflicted to passengers with alleged chickens in strange sauces, soggy salads made with PVC molded like tomatoes and lettuce leafs, and unidentifiable gooey blobs made of sweeteners and unknown fluffy substances. The last one could be labeled as "tiramisú", "cheesecake" or "flan", depending on the airline.